When you partner with Fortna Auctioneers & Marketing Group, our global network of qualified investors aggressively bids on value-oriented debt portfolios. With our global Internet auction system, the backroom whispers of “last resort” are behind us. Not only is the marketing and sale of real estate portfolios by auction today an accepted practice, in many cases, bank real estate portfolio managers consider it a preferred selling strategy. Is It the Right Time for Buying Debt Portfolios? There is risk in every investment. Balancing that risk wisely while assuring the best possible return is the goal of every serious investor. Many professional investors and analysts around the world believe buying debt portfolios offers the potential for huge profits — but is now the right time? Here is what the experts have to share. Is it time to buy real estate debt portfolios? As a Towers Watson professional notes, “Infrastructure as an inflation hedge and will be an area in the next three or four years that will continue to explode”. Although inflation fears aren’t as bad as they were when central banks began tightening in 2008, investors may still be leery of their overall debt exposure because the risk of default still exists. A vice-president in the global real assets group at JP Morgan says to expect only low-to-moderate inflation. Still, “there is a case where inflation goes up significantly and its likelihood is not negligible”. The investor should still seek to minimize or otherwise mitigate the risk because the effects otherwise can be very destructive. A senior executive at BlackRock echoes that sentiment, noting there is no immediate concern about inflation; however, he feels that for index-linked liability-driven institutional investors, the risk of inflation must always be given top priority. Research indicates there is a growing appetite for alternative asset classes among investors, especially for infrastructure, including buildings, roads and public works. In a survey of global institutional investors, holdings in alternative investments showed net during the first quarter of 2013. In addition, one-third of respondents anticipated increasing this allocation. If you’re among the investors or finance professionals who believe buying debt offers real opportunity, real estate portfolio assets meets this need. Seventy-two percent of respondents who describe themselves as investors name real estate assets as one of the better candidates for increased allocations. With interest rates still near their historic lows, it’s still the right time to buy real estate debt portfolios. Right now, only 35% of the investors surveyed held less than 5% in real estate assets. With low asset prices, low-interest rates and over one-third of professional investors surveyed owning real estate with that number set to increase, the time to invest in a real estate debt portfolio is now. There are more reasons to make a real estate debt portfolio part of your investment strategy this year. Real estate and other infrastructures’ popularity reflect investors’ desire for stability. Reducing risk was the second-biggest change investors expected to make to their portfolios this year, with many respondents looking to cut risk. What is the biggest change? Investor movement. The most common theme among surveyed investors is an interest in diversification into new asset classes that protect against inflation and offer the opportunity for significant capital appreciation. In addition, JP Morgan agrees the data supports the theory that real estate as an asset class performs well during periods of high inflation when compared to stocks, bonds and commodities. Between 1972 and 1982 (the OECD’s last period of high inflation), US consumer prices increased at an average rate of 8.7% compounded. During this same period, the S&P 500 index and US investment grade corporate bonds generated CAGRs of 1.8% and 6.8%, respectively. Commodities returned just 3.2%. Inflation exposure can be reduced — but not eliminated — by a diversified debt portfolio. As an investor, you can balance the risk of investing in real estate debt portfolios wisely by purchasing them at auction. By definition, a real estate auction is an innovative and effective method of selling real estate. The process has a built-in intensity and sense of urgency that assures the sale of the property at the true market value. Although you may not make decisions based on emotion, the fact is that 99 percent of auctions by Fortna Auctioneers & Marketing Group sell and close within 45 days. As a seller, you dictate the terms and conditions. You also avoid frustrating negotiations that can kill many deals and prolong the amount of time you’ll pay carrying charges. You’ll also avoid paying most closing fees or paying for an expensive marketing campaign that may not reach the qualified pool of buyers you need to secure the best possible transaction price. As a seller, you benefit because you’ll reach the biggest pool of qualified, prepared buyers possible. Fortna Auctioneers & Marketing Group works with aggressive, professional investors from around the world. And these days, because of the Internet, the “pool” is not limited to local or regional buyers. It is a truly international arena. That’s exactly why it benefits you to partner with the professionals at Fortna Auctioneers & Marketing Group. We are organized to offer your portfolio, full or partial, to an audience of potential buyers of your choosing…for sale by auction. Our services include the traditional live auction, Internet domestic or full international online buyers, or any combination of the buying options. We discuss your situation, and mutually agree on the final buying strategy. In all cases, the buyers we find are prepared, and prequalified, to buy. Because of the competitive nature of the auction method, the likelihood of achieving a full market value return is excellent. Timely disposal of the properties reduces the burden of long-term carrying costs, maintenance and taxes. Potential buyers are pre-qualified, and are large in number. You know exactly when the properties will sell, which is beneficial to your budget planning. Eliminates “showing” the properties to numerous potential individual buyers. Buyers simultaneously receive a “due-diligence” packet. The playing field for the buyers is level. Want more information about Fortna Auctioneers? Download our brochure by clicking the image below. 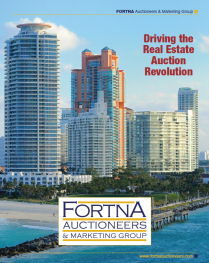 Or call us at 1.855.912.2494 or contact Fortna Auctioneers & Marketing Group for more information today.